To make red marmalade of quinces; take a pound of quinces and cut them in halves, and take out the cores and pare them; then take a pound of sugar and a quart of fair water and put them all into a pan, and let them boil with a soft fire, and sometimes turn them and keep them covered with a pewter dish, so that the steam or air may come a little out; the longer they are in boiling the better colour they will have; and when they be soft take a knife and cut them cross upon the top, it will make the syrup go through that they may be all of a like colour; then set a little of your syrup to cool, and when it beginneth to be thick then break your quinces with a slice or a spoon, so small as you can in the pan, and then strew a little fine sugar in your box’s bottom, and so put it up. To make white marmalade you must in all points use your quinces as is beforesaid; only you must take but a pint of water to a pound of quinces, and a pound of sugar, and boil them as fast as you can, and cover them not at all. The quinces I received are huge (about a pound each), so I used one for each type of marmalade. 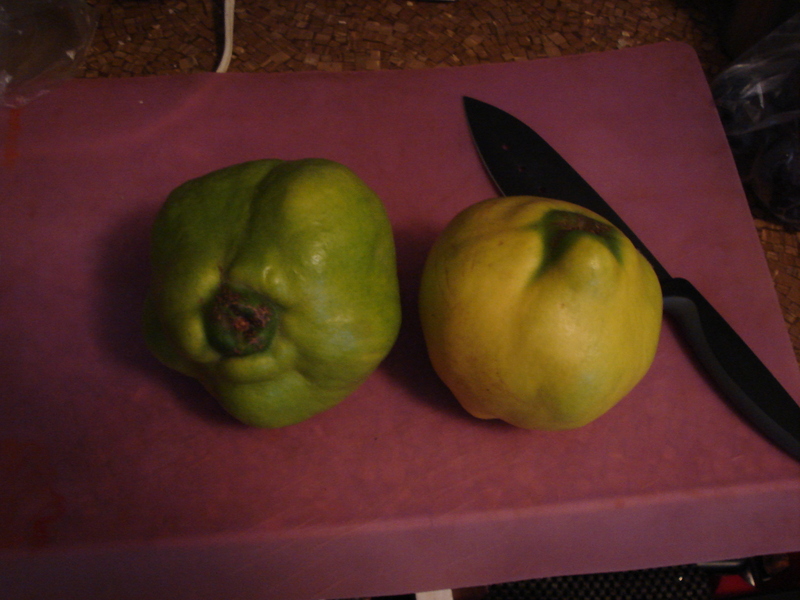 Large quince fruit prior to cooking. Peel the quince using a knife or vegetable peeler, cut it in half and remove the core. Place in a medium saucepan with the water and sugar. Simmer over a low heat, loosely covered, for about 2 hours. Turn fruit occasionally during cooking. After the first half an hour, take a knife and made two perpendicular cuts on the outside of each half. Once most of the water has evaporated and the fruit is in a thick syrup, use a spoon or potato masher to break the quince apart into evenly distributed bits. The only difference between this and the preparation method above is that it is cooked quickly to prevent the red color from developing. The raw quince fruit has a light, cream-colored flesh, and so in this instance we are trying to preserve that color rather than allow the reactions to occur that turn cooked quince red (see a blog post with a brief explanation of that process here). The water is reduced by half so that it evaporates more quickly. Peel, halve, and core the quince. Combine the halved fruit in a pot with the water and sugar. Boil rapidly until a thick syrup develops (about 30 minutes), then break down the fruit with a spoon or potato masher to desired smoothness. 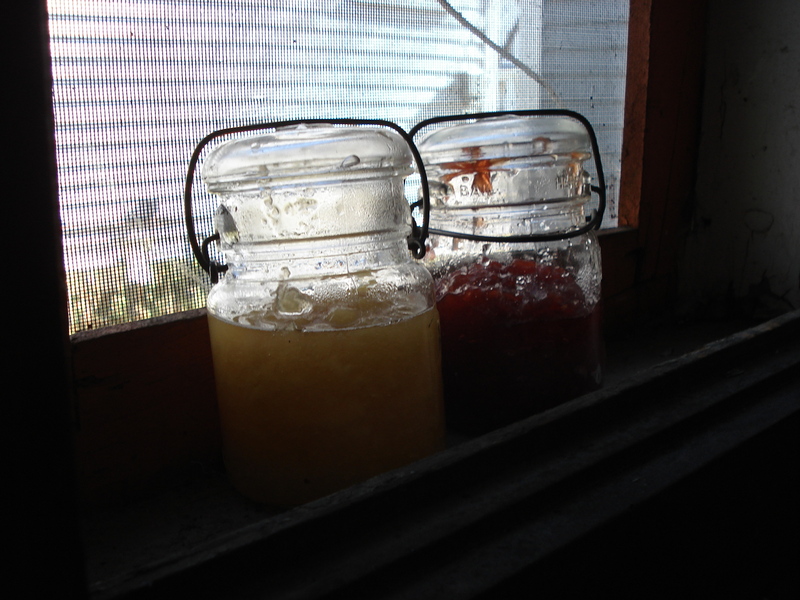 The finished white and red marmalades. where did you order the quinces from? I had ordered them from Diamond Organics but when I checked there later on they didn’t have any more. Quinces are a seasonal fruit that is available in the fall, so it may just be that they don’t carry them year round. Everywhere else I looked only had them in massive quantities! So, …which was the better tasting? The Red or the White?